At Sail Port Stephens 2014 four seasons in one day perfectly describes day two. Looking around the magnificent bay there were literally microclimates in each corner; dark storm clouds on one side, sunshine on the other and wind ranging from five to near 30 knots late this afternoon when the Pantaenius NSW IRC Championship fleet finally broke out of the stalls in Salamander Bay. Principal Race Officer Denis Thompson took the IRC fleet offshore this morning as planned, but a gust in the high twenties and updated forecast brought them back inshore. Then they had to find space on a crowded bay with all other divisions standing firm on their patch of water. 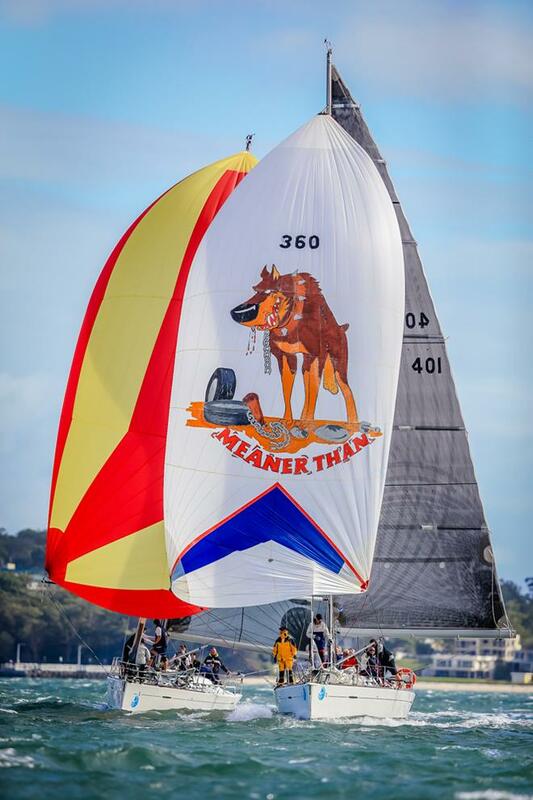 Performance Racing completed three short course sprints to the north of Salamander Bay and the MC38s two windward/leewards while Performance Cruising finished the iconic ‘pub to pub’ race from Shoal to Salamander Bay. It’s busy at the top of Performance Racing division one results with one day remaining. Matthew Fensom’s modified Farr 40 Long Time Dead from Newcastle still leads the division after four races, but flanking them is Thomas Woods’ Farr 36 OD Toy Story from Lake Macquarie, also on 10 points. 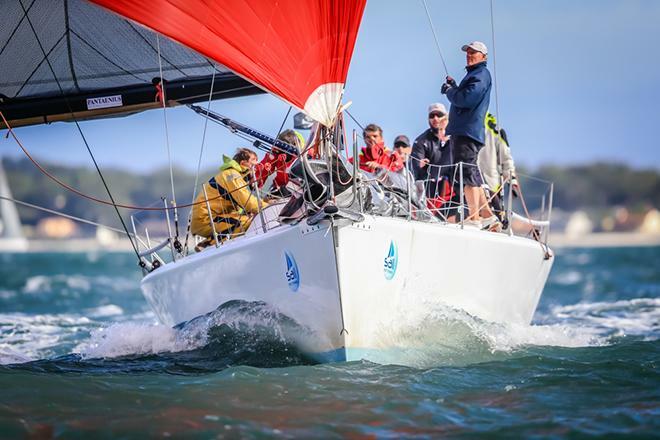 The story reads the same in the MC38 division, John Bacon’s Dark Star from Pittwater moving into Kiwi territory, now on equal points and second on a countback to Howard Spencer’s Menace from Royal Akarana Yacht Club after three races. The Australian MC38 class is readying for a serious jab in the arm. Four new owners and crew who know a thing or two are soon to join the program and Bacon has amped up his in anticipation. In the Pantaenius NSW IRC Championship overall pointscore Karl Kwok’s Team Beau Geste has kept Patrice at bay, but the margin is tight, just two points. 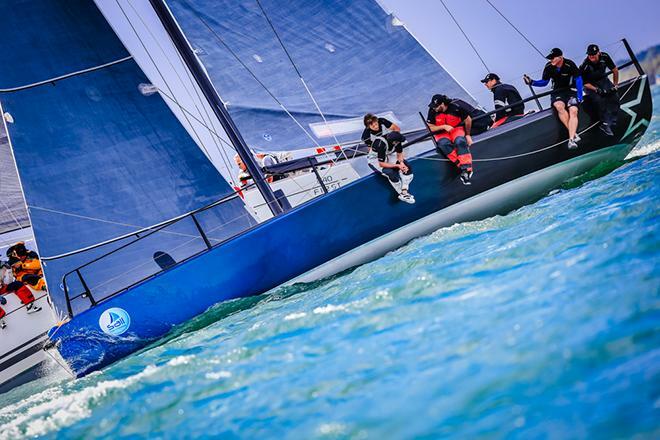 Tactician on Tony Kirby’s Patrice, Darren Jones, realises a TP52 is going to be hard to beat given they are six foot longer and carry more sail area, plus they plane first when the bullets hit. Showing they are not to be messed with in light or heavy airs Roger Hickman’s Wild Rose holds its IRC division two lead, now six points clear of L’Altra Donna after two more races in 25 knot average sou’westers punctuated by rain squalls. Tomorrow is the final day of the three-day Pantaenius Port Stephens Trophy and on Monday April 14 the second stage, the Commodore’s Cup for cruising boats begins. The Bureau of Meteorology has a strong wind warning in place for Hunter Coastal waters for tomorrow, forecasting S-SW 20-30 knots easing to southerly 15-25 knots in the afternoon.